The early 13th century was a dark time for the Mediterranean Coast. The Cathars - a Christian sect distinct from the Catholic church - were thriving in the south of France, but the Catholic Church did not recognise them as truly Christian, and when legate Pierre de Castelnau was murdered in 1208, Pope Innocent III declared the Albigensian Crusade to wipe out the Cathars. The Pope wrote to King Philip II to appeal for his intervention, and the King permitted his more ambitious barons, notably Simon de Montfort, to make war against the Cathars and their allies in the Languedoc. Around 10,000 crusaders gathered for the beginning of the crusae during 1209, marching south from Lyon to the lands around Montpellier. 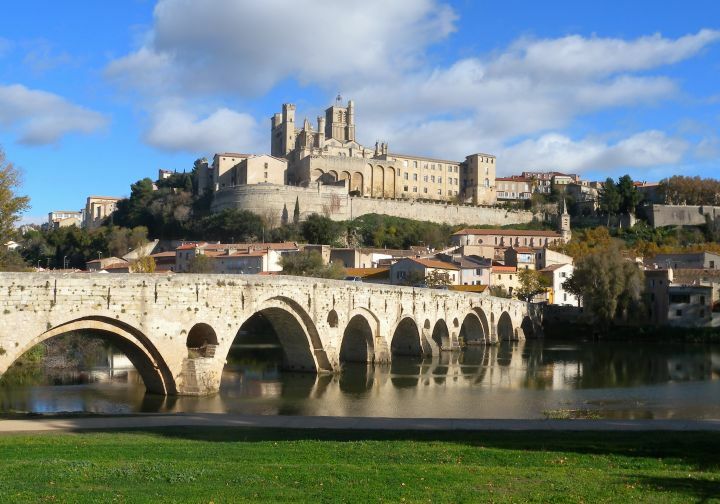 It was in July that they reached Béziers, where they besieged the city, demanding that the Catholics in Béziers leave and the Cathars surrender; but when neither group did as ordered, the crusaders invaded the city, slaughtering the population and burning the city to the ground. When asked how the crusaders should distinguish the Cathars from the Catholics, papal legate Arnaud Amalric - the man in charge of the siege - is said to have replied "kill them all; God will know his own"; even the priests in the Béziers cathedral were put to the sword. The crusaders' next target was the fortified city of Carcassone, where many Cathars had taken refuge from the invaders. The siege of the city did not last long; within a week the crusaders had cut off the water supply, and the defenders surrendered a week later. The people of Carcassonne were not massacred as Béziers had been; instead, they were expelled from the city, naked but for their "shifts and breeches". With the Viscount de Trencavel imprisoned in his own dungeon, Simon de Montfort was appointed the new viscount, and would go on to add to the city's fortifications after Trencavel died mysteriously three months later. The fall of Carcassonne also saw many other towns surrender without a fight. Over the next year, the crusaders brought down the cities of Lastours and Minerve; however, their siege of Toulouse was short on men and supplies, and Raymond de Toulouse led a counter-attack against them. In 1213, the Cathars turned to King Peter II of Aragon (in northern Spain), for help; the king agreed to help thanks to his family connection to Raymond, but Pope Innocent denounced him and ordered the cursade renewed. Peter was struck down and killed in battle, and by 1215 Montfort was able to capture Toulouse for himself. Despite having to deal with uprisings and Montfort's death, the crusaders hunted down the remaining Cathars over the next decade, with king Louis VIII heading the crusade; and though a few remained, the church's Inquisition prosecuted them for the remainder of the century, until Pope Clement V introduced new rules to restrict their power. The repercussions of the crusade were many and long-lasting; scholars have argued that the crusade rendered the Catholic church weaker and more dependent on the French monarchy. But regardless, the crusade all but wiped out Catharism as a religious movement, and secured the power of the church in the south of France once more. If you're intrigued by this slice of history, we visit both Béziers and Carcassonne on our Mediterranean Coast cycling tours, now open for enquiries and bookings for 2018; we have Mediterranean tours running from April to October.